The roots of this Merseybeat band go back to Liverpool’s Bluecoat Grammar School where Liverpudlians Hatton and O’Hara were in a part-time band known as The Four Jays in the late fifties and early sixties. The Four Jays’ great claim to fame is that they debuted at Liverpool’s Cavern Club on 1 March 1961, 20 days before The Beatles’ first appearance there. 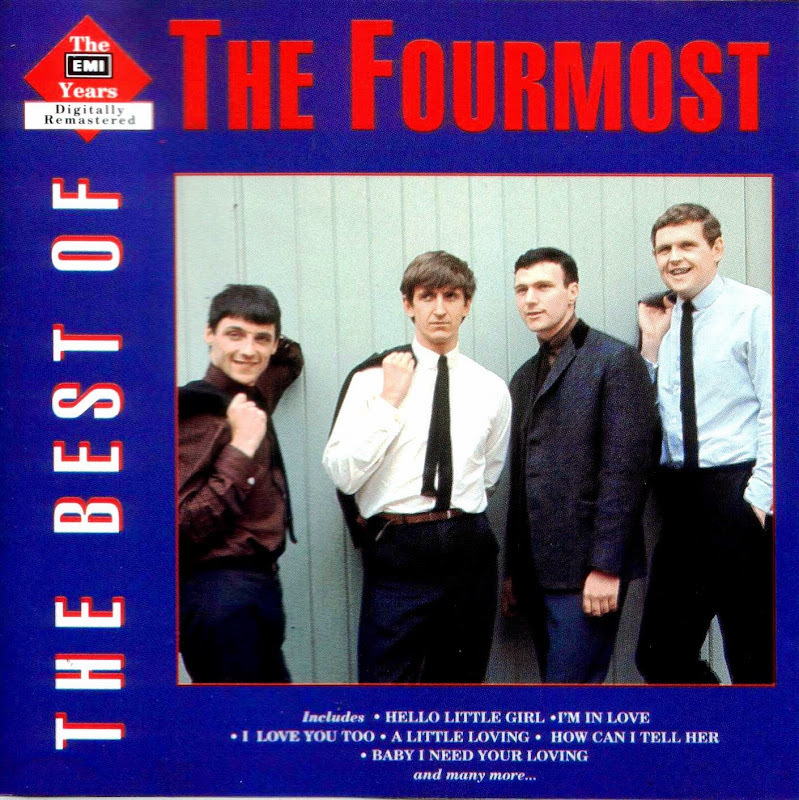 By September 1962 Millward (the only non-Liverpudlian in the band - he came from Cheshire) and Lovelady had been recruited when the guitar and the drum slots became vacant and by November that year they had turned professional changing their name to The Four Mosts. Their big break came in June 1963 when Brian Epstein became their manager, modifying their name to The Fourmost and getting them a contract with EMI’s Parlophone label. The Epstein connection ensured them relatively strong material and for their first single they recorded a Lennon/McCartney song which had previously been offered to Gerry Marsden. It made the Top 10. Epstein was also careful to exploit The Beatles’ connection in their favour and they supported The Beatles in their Christmas show at The Finsbury Park Astoria in December 1963. The follow-up was another Lennon/McCartney composition, albeit a lightweight soft-rocker, I’m In Love, which stiffed at No 17, in 1964. Later in the year they enjoyed an 8-months residency with Cilla Black in the 'Startime’ variety show at the London Palladium. During this time they achieved their biggest hit with Russ Alquist’s A Little Loving, which achieved the No 6 spot. Thereafter, it was all downhill really, in commercial terms at least. How Can I Tell Her didn’t quite make the Top 30 but is of some interest for its rather unusual march time. Their replica of The Four Tops’ first UK 45, Baby I Need Your Loving did return them to the Top 30, though it couldn’t manage the Top 20, but caused some dissent by breaking an agreement that EMI, as Motown’s UK distributor, would not release singles which were cover versions of Motown’s singles. January 1965 saw the group appear in Gerry and The Pacemakers’ film 'Ferry Cross The Mersey’. They played I Love You Too, portraying the losers in a Battle of the Bands competition. In April 1965 they toured the UK with Cilla Black and P.J. Proby, but by now the Merseybeat sound was in decline and their next 45, Everything In The Garden, sold disappointingly as did their album, First And Fourmost. The album, which was largely comprised of cover versions of US rock and pop songs, is now very hard to track down and an expensive purchase. Their final Chart success was Girls Girls Girls, a Leiber/Stoller song earlier recorded by Elvis Presley and The Coasters, which reached No 33. By 1966 the band’s progress was further impeded by the fact that Mike Millward had developed leukaemia. He was soon forced to leave the band and was replaced by Bill Parkinson. (Sadly, Millward died within the year). By now the band had lost all momentum and not even a cover of The Beatles’ Here There And Everywhere was able to propel them back into the charts. In the wake of The New Vaudeville Band’s old tyme revival of Winchester Cathedral, The Fourmost turned next to George Formby’s Aunt Maggie’s Remedy, but again the punters were no longer interested. In 1967 the group switched to CBS but their subsequent singles, including a cover of Jay and The Techniques’ US hit, Apples, Peaches, Pumpkin Pie, and the Paul McCartney-produced Rosetta, also failed. The group continued for a few years on the cabaret circuit before its members drifted away from the music business altogether. They also recorded a 1969 45 for CBS as Format.